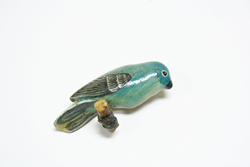 The Mary and Carter Thacher Gallery at the University of San Francisco (USF) will open the fall 2017 season with an exhibition featuring more than 100 handcrafted functional and decorative objects created by Japanese American prisoners during World War II. The show, which is called “Something from Nothing: Art and Handcrafted Objects from America’s Concentration Camps,” will also present two contemporary art installations by Bay Area artists Barbara Horiuchi and Marlene Iyemura. The exhibition will run from Monday, Aug. 21 until Wednesday, Nov. 15, 2017. Commemorating the 75th anniversary of Executive Order 9066, “Something from Nothing” is a tribute to the over 120,000 Japanese Americans imprisoned in concentration camps from 1942-1946. Issued by President Franklin Roosevelt following the bombing of Pearl Harbor in 1942, EO 9066 allowed for the incarceration of all U.S. residents of Japanese descent, regardless of their citizenship status. Prisoners were forcibly removed from their homes and taken to live in remote camps — often surrounded by barbed wire —throughout the western United States and other areas. Close to 8,000 camp prisoners came from the Bay Area, including over 5,000 from San Francisco, primarily from the Western Addition neighborhood which borders USF’s main campus. Highlights of the exhibit include intricate wood carvings, delicate brooches made of shell, paintings depicting the camps’ barren surroundings, a variety of handcrafted functional items and historical photographs. Most objects were made from found and scrap materials. Barbara Horiuchi’s 2009 art installation, “ With Liberty and Justice For All,” invites visitors to learn more about the prisoners’ lives before and after the war, while Marlene Iyemura’s 2014 “To All Persons” uses origami balloons to honor “those who are still recovering from the systematic cruelty.” Both art works offer a younger generation’s perspective on the WWII-era camps. “The incarceration of Japanese American families in prison camps indelibly altered their lives and undermined democratic principles of fairness, justice and equality,” said Brian Komei Dempster, director of administration of the Master of Arts in Asia Pacific Studies program at USF and professor of Rhetoric and Language and Asian Pacific American Studies. As a sansei (third-generation Japanese American), Dempster learned that his mother was imprisoned in Topaz concentration camp as an infant, along with his aunts, uncles and grandmother. Dempster’s grandfather, a Buddhist priest, was separated from his wife and children while incarcerated in various Department of Justice camps. “It’s important that we recognize the trauma of these former prisoners — along with their grace and resilience — and that we don’t allow this to happen again,” said Dempster, who is also a poet. Thursday, Sept. 14, 5:00 - 6:30 p.m.
Poetry, memoir and performances by survivors and their ancestors, followed by a reception in the gallery. Participants include Brian Komei Dempster, Barbara Horiuchi, Janice Mirikitani, Brynn Saito, Sumer Seiki, Florence Ohmura Dobashi, Sato Hashizume, Kazuko Iwahashi, Jon Osaki, Toru Saito, Harumi Serata and more. Co-sponsored by USF’s Asian Pacific American Studies department and the Master of Arts in Asia Pacific Studies program. Thursday, Oct. 5, 5:30 - 7:30 p.m.
A panel discussion between USF Law School Professor Bill Ong Hing JD ’74; Dean Ito Taylor JD ’78, executive director, Asian Pacific Islander Legal Outreach; and Korematsu legal team members Karen Kai JD ’78 and Robert Rusky JD ’78 on the legal, social and historical precedents of Executive Order 9066 and its link to current immigration issues. Co-sponsored by the Master in Migration Studies program. Tuesday, Oct. 24, 3:00 - 4:20 p.m.
A conversation on the ethical implications of collecting, preserving and exhibiting culturally significant objects with Paloma Añoveros, Karren Shorofsky, Rosalyn Tonai MA ’88 and Nancy Ukai. Co-sponsored by USF’s Art History/Arts Management program and Master in Museum Studies program.